Categories: Smiles | Tags: acorn, autumn, nuts, silly squirrels, squirrels, true facts | Permalink. As you may know, the last few weeks have been very busy around the picnic. I’ve finished crocheting all the little details for the story section of The Big Acorn Race, and now I’m getting ready to start photographing all the dioramas later this week. Yep, that’s how I’ll be spending Thanksgiving. But don’t feel too bad for me — you know I’ll be having fun! And I have a lot to be thankful for this year. I am so thankful for the opportunity to create this book. I’m thankful for Hodge and Podge and all their friends. I’m thankful for my own imagination and creativity, which keeps me entertained and active every day. I’m thankful for my husband and family and friends, who have listened to me, supported me, and given me valuable direction over the years. I am also very, very thankful for each of you. 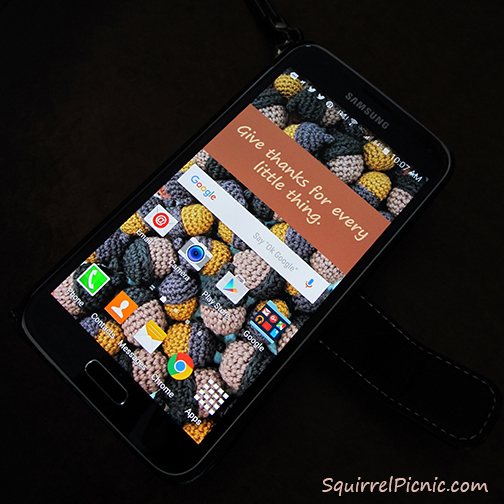 There really wouldn’t be a Squirrel Picnic without you. Thank you all for stopping by, offering your ideas, suggestions, and encouragement, and inspiring me to design fun and playful things for us all to share. Speaking of designing fun things. I wanted to give you a present to help you celebrate Thanksgiving. Even if you are not in the U.S. you can use this as a reminder to be grateful for all the big and little blessings in your life. 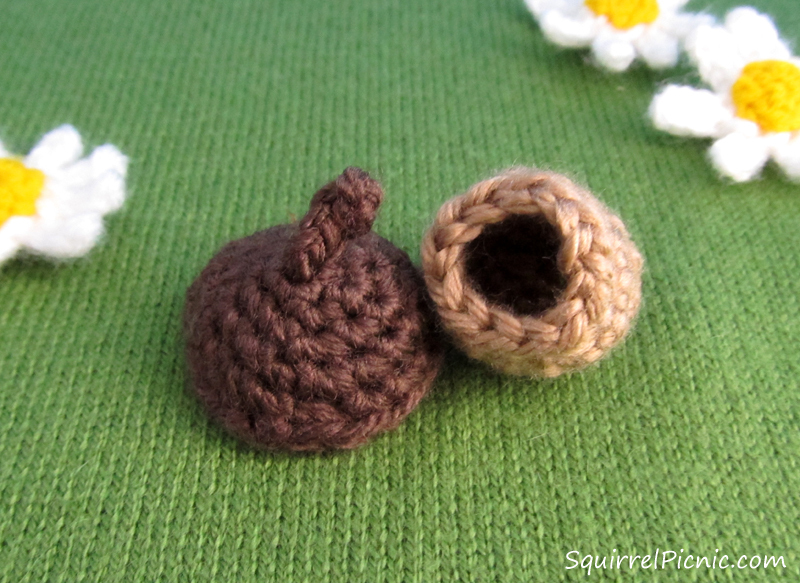 It’s an image of crocheted acorns that you can save as your wall paper on your desktop or mobile phone. I crocheted each of these acorns on my commute to and from work over the past few weeks. They are so fun and easy to make. Categories: Friends, SQUIRREL PICNIC (the book) | Tags: acorn, autumn, crafts, crochet, diy, fall, Thanksgiving, wall paper | Permalink. May was an unusually wet month for Colorado. The state prides itself on its 300 days of sunshine, but this month we had only 3 days without some form of precipitation. 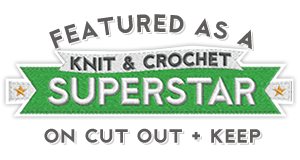 Rainy days are perfect for crocheting and I crocheted up a storm all month long! I focused on designing, crocheting, and photographing the first four patterns and projects for the book. These include an oak leaf motif, an oak leaf clutch, an amigurumi acorn, and an oak leaf and acorn garland. 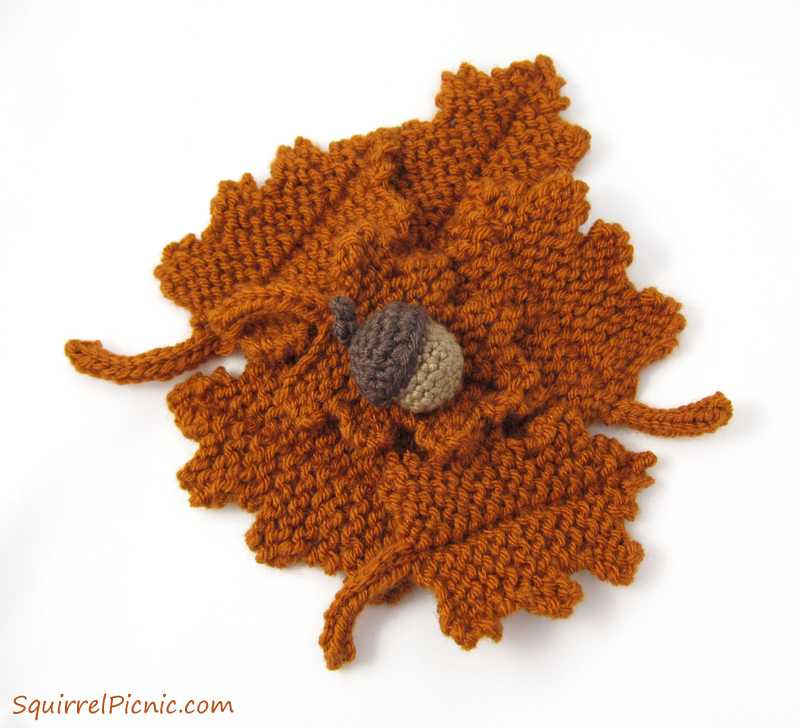 Categories: SQUIRREL PICNIC (the book) | Tags: acorn, Big Acorn Race, book, crochet patterns, garland, oak leaves, purse | Permalink. 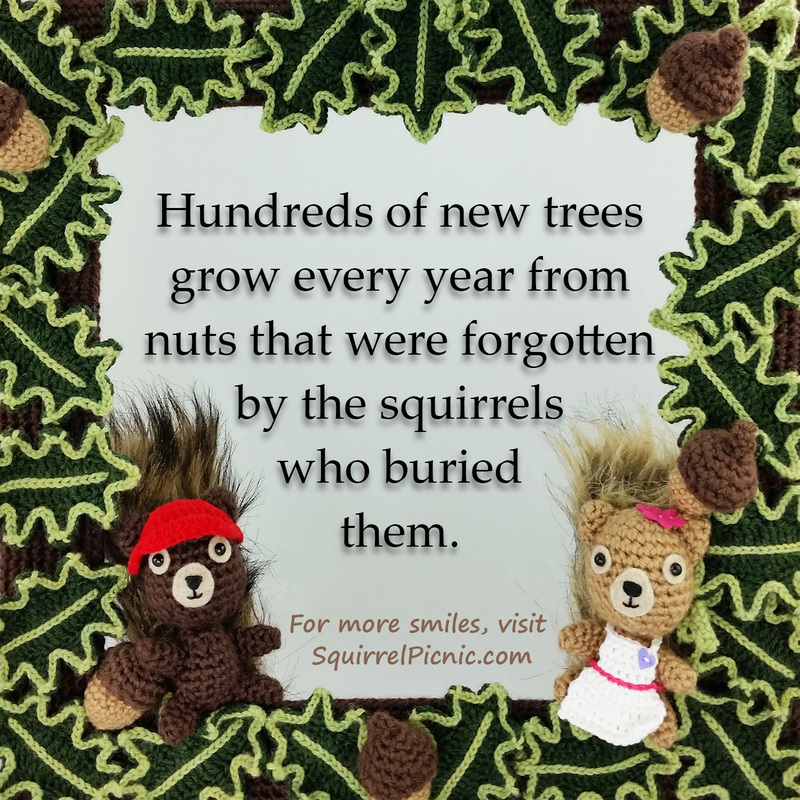 Hodge and Eric showed us over the last few weeks how acorns are a treasured gift among squirrels, but I think the crocheted variety could come in handy for us humans too. Below are some unique and creative ways you might use these acorns. And, as always, here’s the free pattern to make your very own! 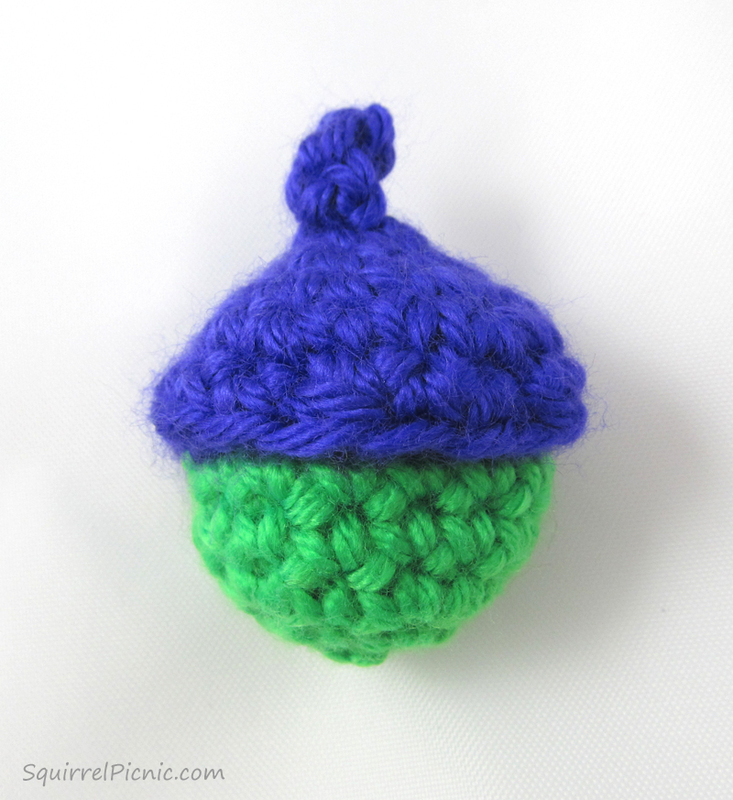 My pattern includes instructions on making a cap and a bottom, which you sew together to form an acorn. If instead you don’t sew the cap to the bottom of the acorn, you’ll have a unique gift box in which to hide a little present. Add acorns to a fall wreath or mantel display. 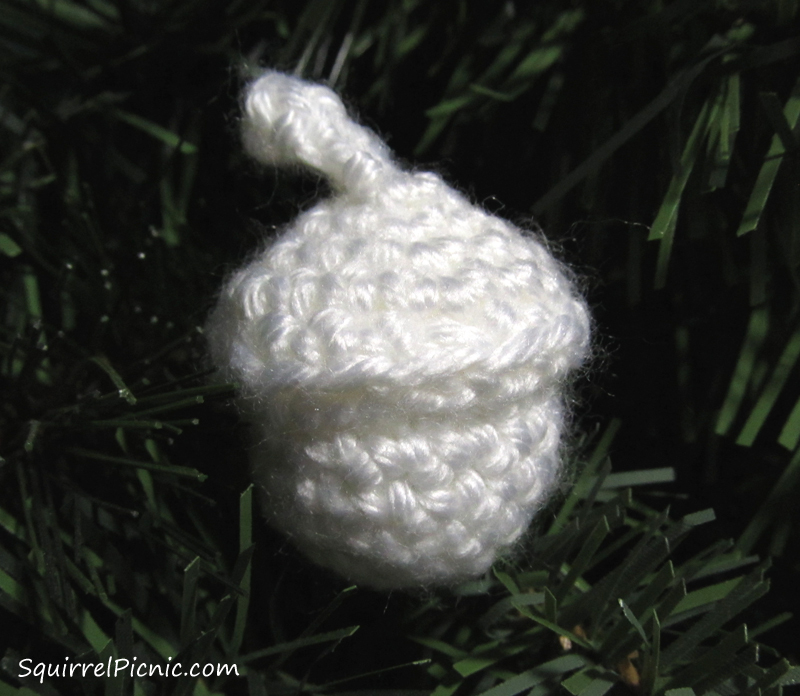 Crochet your acorns in holiday colors or all white and hang them on your tree or display them in a decorative bowl on your coffee table. String a cord through the stem and wear the acorn as a necklace. 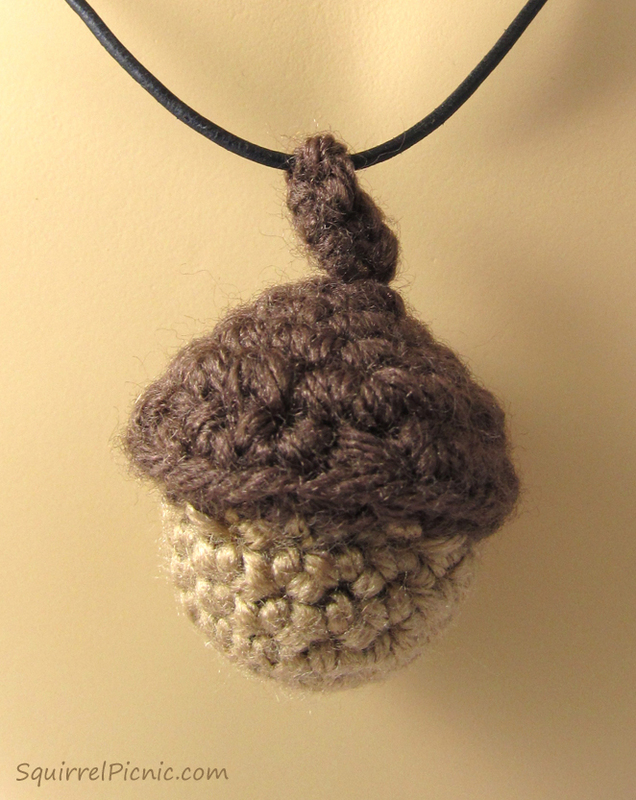 Use bright colors and a crochet hook size H-8 (5.0 mm) or larger to make an acorn like Eric’s bioengineered one. These acorns would make wonderful pincushions, present toppers, or even cat toys. Categories: Crochet It | Tags: acorn, cat toy, Christmas, crochet, decorate, diy, fall, home, home decor, necklace | Permalink.